Seven nights full board in Spain as part of a small group (max 4 per coach) learning how to cycle, run and swim in readiness for a triathlon or other important physical event. If you’re thinking about a triathlon or want to consider competitive cycling, this week-long small group camp (max 4 participants per coach) in Spain is definitely deserving of its affordable price tag. As you’d hope from a cycling & triathlon holiday for beginners one on one coaching, video analysis, massages and muscle coordination sessions are all included with advice on bike riding, running and open water swimming helping athletes to build up confidence and prepare for future races. From learning how to handle, put together and maintain a bike to discovering the keys to pace, gears and descents, our experts are on hand to advise and teach to ensure you’re already for your first triathlon or just feel like pushing yourself a little bit further on two wheels. Swimming is another area where our experts can open up your world and allow you to learn how to approach and swim in one of the world’s most stunning stretches of inland open water. Running is the final part of the three-piece jigsaw and you’ll be encouraged and advised how to strengthen your form as well as how to make the transition between each of the key triathlon disciplines. Breathing instruction is a huge part of cycling & triathlon holidays for beginners with Spain’s climate certain to help you upon your return home just as much as our experts’ analysis of your neuromuscular physiology and muscular coordination to ensure you’re fit to tackle anything as well as reducing the risk of getting injured. As we only invite a maximum of four athletes on our beginners cycling & triathlon holidays we can guarantee you’ll get all the attention you need as well as tailor making individual care to fall in line with what you feel comfortable with and whatever else you need to improve your experience. From ironmen entrants to cycling events to youth or family or one to one training programmes, we can help you train as part of a small group or as a pair or on your own to give you every chance of progressing and strengthening within your discipline as well as improving chances of competitive success. 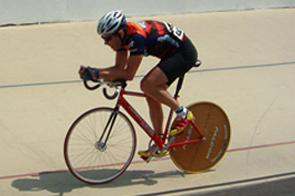 Gareth started running at age 11 and after an injury moved to cycle racing at 16. He has raced throughout Europe, Australia and the USA on the road, the velodrome and in mountain bike events. He has represented his country in duathlon and triathlon at age group level. Gareth is an expert cycling coach, bike set up guru, a Level 2 Triathlon Coach and a qualified first-aider. Fiona gained her PhD. at Cambridge University, in the UK. Following her PhD she went to TSRI, La Jolla USA, to research synaptic plasticity for 6 years. With a thorough understanding in the body's physiology and also with her speciality in neurophysiology this enables her to have a more scientific approach to the coaching of cycling and triathlon.